Transform the empty shell you call a house into an inviting, cozy home using IHF Home Decor products! IHF Home Decor spent more than a decade in perfecting the production and design of one-of-kind home decor pieces. They've successfully beautified residential and commercial spaces with their unique area rugs, carpeting, and window treatments among others. Today, the company is known for converting their design ideas into comfortable, stylish, and exclusive home decor. To ensure you get the best pieces from IHF Home Decor, check out our buying guide and top picks! When it comes to IHF Home Decor products, you can expect them to feel just right at home in your space as they have a cozy look and feel. Yes, even their dishtowels! If you want an area rug from IHF, you probably want hand braided products as they are what the company is known for. Braided rugs are luxurious with their 100% natural materials and appealing, thick look. They're also reversible, so you get the most bang for your buck. As for the material of a home decor from IHF Home Decor, you'll only find natural instead of synthetic materials. We would suggest you get jute if you want a material that's strong and cheap as cotton is rather soft and more expensive. Take your time when you're measuring your space and fully understand the context wherein your purchase/s will be placed. This will help you save yourself a lot of money that you would've spent to correct a costly mistake. The scale of home decor items is quite difficult to measure when they're on your monitor. So, quickly draw a floor plan so you know how the items will look and feel when they're incorporated into your space. With these aspects in mind, you'll be able to pull off a complete makeover of your interiors using only affordable IHF Home Décor products. If you're ready, let's move on to our favorite part and that's shopping! Take a peek at our top picks below. 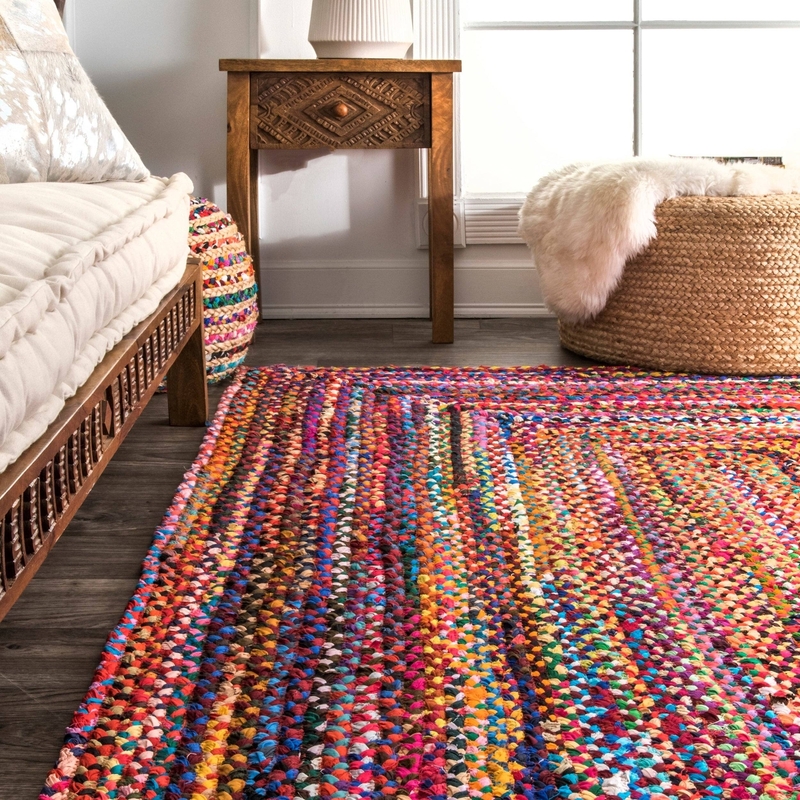 If you're fed up of solid color area rugs and shag carpets, then this hand braided Kistler multi area rug from Zipcode Design will please you with its vivid colors and handmade design. It is one that's sure to grab attention. Being made in India, it's handcrafted using 100% cotton to stand out and offer a soft feel under your feet. The natural fibers that are found in this hand braided blue area rug by Mistana gives it its durability and softness that outperform any other area rugs. This area rug consists of cotton and jute fibers that just look and feel incredible. It's available in several different sizes and shapes as well. Give your window a touch of Southern flair with this Vintage Star Wine Valance Window Treatment. It is made of 100% cotton and features a simple check in earthy hues. It measures 60 x 16 inches, making it easy to pair with other window treatments for a coordinated look. Made of 100% natural cotton fabric, this IHF dish/kitchen towel has a super-soft handle and fast-drying properties. It measures 20 x 28 inches. What really is striking about this product is the material that's been used. It's sustainable cotton which shows the commitment of the company to tackle waste, health, fair partnerships, and climate change. Oval area rugs, like this 100% jute number, are an excellent way to furnish large entryways. Top this one from IHF Home Decor with a simple round table and you'll ground your living space with a stunning statement piece. It's a hand-braided rug that's ultra-soft and naturally made using a sustainable material. The muted color and ribbed effect ensure spills won't show as easily. A durable bed skirt with high-quality construction and 100% natural materials, it has a pattern that's incredibly easy to pair with a room's decor. It's designed to last years with its high-quality cotton fabric. Also, it is a wrinkle-free and fade resistant bed skirt beautifully ruffled without any split corner. This rag rug is possibly your most budget-friendly option, and it is surprisingly durable. If you opt for this product, you'll find two amazing aspects by the time you lay it down on your floors: first, it only gets better with age. Second, it already shows some signs of imperfection, which is great as you won't mind the stains or scratches you'll soon give it! Nothing brings a living room together better than this braided rug's pattern under your feet! What's amazing about this one is it's a rug/carpet that's capable of transforming your home instantly and we're not alone when we say this. We've heard the sentiments of top decorators and they love how the rug can inspire the decor of an entire room! These country style rugs come in different sizes. Their versatility offers you with so many options on how to use them. You can add an oversized one in your living room to set the entire room's mood or add several pieces in your kitchen as runners. Regardless of the size that you choose, you can expect the rug to be beautiful and full of color. You'll be surprised at how it can work wonders, especially in a hallway! A set of 4 round cover pads for stools, they are created with rich earthy tones for a beautifully crafted seating. It comes with a subtle yet stunning variegated look. The water drains through the high-quality jute fibers, and the pads dry out quickly. They're even impervious to the development of mold and mildew!